Is It Good? 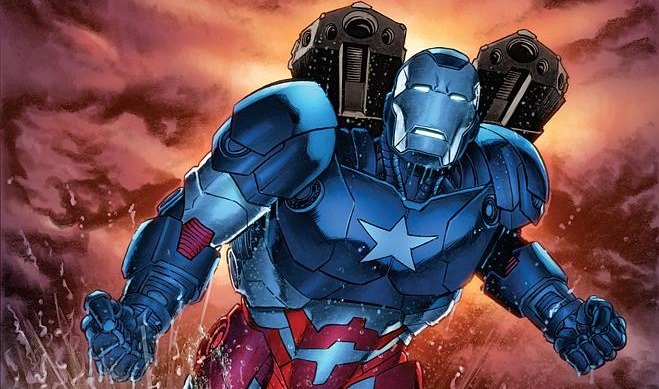 Iron Patriot #1 Review – AiPT! Iron Patriot (you know, the new name Rhodey is going by now since that’s what he was called in Iron Man 3), the latest title from All-New Marvel NOW! (still a darn goofy name) has arrived, helmed by Ales Kot. Honestly, I am not sure if this is a mini-series or a whole new series due to different sources. Either way, is it good? Go my little mechanical crab creations! Spread my song throughout the seas! That’s two for two, with another solid first issue on a new Marvel series from Ales Kot. With the trappings of a political thriller Kot paints a very interesting story and new direction for Rhodey as the character is determined to try to make things right. The characterization is fantastic here, really humanizing Rhodes with his political views and bringing his family into the supporting cast. You get a really good sense of what kind of character he is, even if you are not familiar with him all that well, and really want to see him succeed. The story is very engaging, even though this issue doesn’t really get going right away. The issue is more about establishing what kind of character Rhodes is, while also getting a big conspiracy going in the background. We don’t know much about why this change has ticked people off or why they want him to fail, but the plans and their ideas that we are starting to get small sneak peeks of do seem interesting. Hopefully, the book continues exploring this political angle, since I wouldn’t mind seeing more how people are reacting and responding to what is going on with the Iron Patriot. The only thing I can say negative about this debut issue of Iron Patriot is that the ending scene feels a bit rushed, like Kot needed to rush out a big cliffhanger in the last three pages so he cuts to a monster attack out of nowhere. I also don’t know why this is four dollars since nothing about it scream being worth four dollars (the character is popular, but certainly not A-list), but that’s a discussion about lousy price raises for some other time. Look, just because it has a toy sounding name and color scheme, does mean the Iron Patriot is a toy. The artwork is brought to us by Garry Brown, who I have never heard of before. His work, along with the coloring and inking, makes the book look like a cross between Patrick Zircher and Michael Walsh. There is a grittiness to the lines and inking, the way the colors look, and how the violence is displayed that matches closely with Zircher’s style. There’s also the simplistic nature to the characters and some of the scenes, including some layouts, which have the feel of Walsh’s style in areas. It gives the book the right feel and tone, knowing how to balance light and dark between scenes. The only the problem with the artwork is that the character models can look pretty awful at points, with scratchy and scribbled-looking faces, or such a lack of detail that people look completely inhuman at points. Iron Patriot #1 is a fantastic start for this new (mini)-series. The character work is fantastic, the themes and story engaging and intriguing, and the artwork really well suited for the tone the book is presenting. Questionable price point aside, this is a book that maybe worth your time and is definitely recommended.